Note: Typically used perimeter hem. Suited to your product/manufacturing choices via order page. Pneumatically Pressed Grommet Eyelet seals. Part A Grommet Eyelet and Part B Washer are pnuematically sealed under pressure. Grommet Eyelets are intended for securing lightweight banner fabrics for general use and not considered a weight bearing form. Do not apply excessive strain or outward pressure. 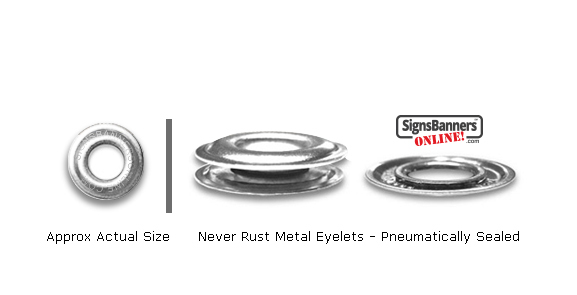 No Rust: The metal compound may oxidize and discolor over a period more than 36± mths. The banner application life is shorter than Grommet Eyelets. No special handling requirements. Wear PPE. No special storage requirements. Protect red brass from moisture. Skin-Eyes: May cause mechanical irritation. Contact with molten material may cause thermal burns. Exposure Guidelines: Protect against hazards such as contact with high cutting machines. Eyewear: Safety glasses during processing. Inhalation: Not respirable in this form. Respiratory: An approved dust respirator should be worn. Ventilation: Thermal processing requires ventialtion of fumes and vapors which may cause irritation to the nose and throat. Ingestion: Not a probable route of exposure. Ingredient Name: Copper, Zinc. Plating: Chromium, Nickel. OSHA PEL 0.1 fume 1 dust. Shiny silver colored metallic solid, it has no odor and is not soluable in water. NO Rust. Hazardous Decomposition Products: Thermal decomposition products may include hydrogen gass when exposed to acid and other C, H, and O compounds varying in chemical structure and molecular wieghts. Hazardous Polymerization: Will not occur. Toxicological Information: Not considered to cause irritant or allergic contact dematitis. Delayed: None shown. Disposal Considerations: RCRA: No. Other Disposal Considerations: Dispose as nonhazardous waste in accordance your regulations. Other Toxicological Information has not been determined. Machined edges may be sharp. FIRE: Do not use water on molten metal. Finely divided dust is flammable. Independent Testing: None: This page is general information only and the product supply line may change from time to time. Fire Fighting FLASH POINT: Not applicable. Flame Propagation Rate: Not determined. NFPA Ratings: Health-1 Fire-0 Reactivity-1. Flammable Limits In Air: NA. Fire Fighting Media: Water spray or ABC dry chemical. Fire Fighting Equipment: Wear full bunker including self contain breathing apparatus to avoid exposure to smoke and vapors. Unusual Fire And Explosion Hazards: NA. Physical & Chemical Properties: Melting point 990°C. Decomposition Temperature: >1300°C. Solubility In Water: None. Chemical Stability: Stable. Incompatability: Strong acids and bases. Explosive compounds formed in the presence of acetylene. Flammable hydrogen gas will evolve when red brass is exposed to acid. Recycle: Red brass is valuable and may be recycled. Avoid melting red brass chips covered with metal cutting oil this will cause fugative emmissions.